This heater has advantage of pre-heating the engine as well as the passenger compartment. It uses the car's own water system with heat exchanger and fan. This is the second generation Hydronic heater (latest model introduced in 2014). 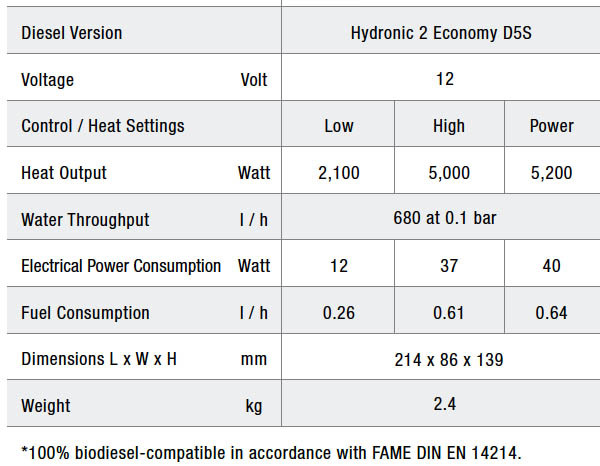 The main differences from the older Hydronic 5 versions - improved fuel efficiency, works faster and it is more reliable than its predecessors. It also works with the new type Easysart controllers / timers / GSM System. HEATSO.com Recommends Hydronic II D5S ! Double benefits: warming up the passenger compartment and engine and therefore making starting easy, protecting the engine, saving fuel and helping the environment. Comfortable warm air distribution using the car's own air vents. Installation in the engine compartment possible in almost any car. Can be controller by timer, radio remote control or smartphone.